Using energy and water more efficiently produces multiple benefits, often with no or minimal cost. By using fewer resources we benefit financially, save resources for future use, reduce our country’s reliance on fossil fuels and lessen our contribution to global warming. If you live in rental housing, you may feel that you have little control over your utility costs. With some limitations, there are still many simple, practical things you can do to avoid wasted resources while maximizing the comfort and health of your household. The following tips can help renters make smart, resource-efficient decisions. If you are looking at an apartment in a building with multiple apartments, the location of your apartment within the building can have a big impact on your energy bills. If you like to be cool in the summer, try to choose one on the north side or one that will be shaded in the summer by trees or other buildings. This will reduce the energy you use for air-conditioning and will make your home more comfortable during the hot months. Multi-story buildings and apartments that share walls with other apartments use less energy than single story or single unit buildings that have a similar size and construction. Avoid apartments on the top floor or at the end of the building. Being sandwiched between other apartments will help insulate you from extreme hot or cold temperatures. Remember a larger unit will require more energy to heat and cool. Before you rent, think about the relative energy and water usage you would expect at each unit you consider. Ask the person showing you the rental about typical usage by past residents. Ask if any utilities are included in the rent, but be aware that even if the landlord pays some or all of the utilities, an estimated cost will be folded into your rent. The average per unit that the landlord pays can be compared to corresponding costs at other units you may be considering. If you pay for your own utilities, ask to look at past utility bills in both the summer and winter months, and note what services are included in the bills. Some utilities bills combine multiple services, such as electricity, natural gas, water, wastewater, and garbage pickup, as well as other fees and taxes. Other locations may have separate providers and multiple bills for these services. The loss of heated or cooled interior air to the outdoors is a major source of wasted energy. Most of us are unaware of this loss because air escapes through small cracks around doors and windows, ceilings and floors, plumbing and vent penetrations, and even electrical outlets. Much of this energy can be saved by sealing these seemingly small gaps, and uncomfortable drafts may be eliminated. Begin an inspection by checking the doors and windows to make sure they open and close well. 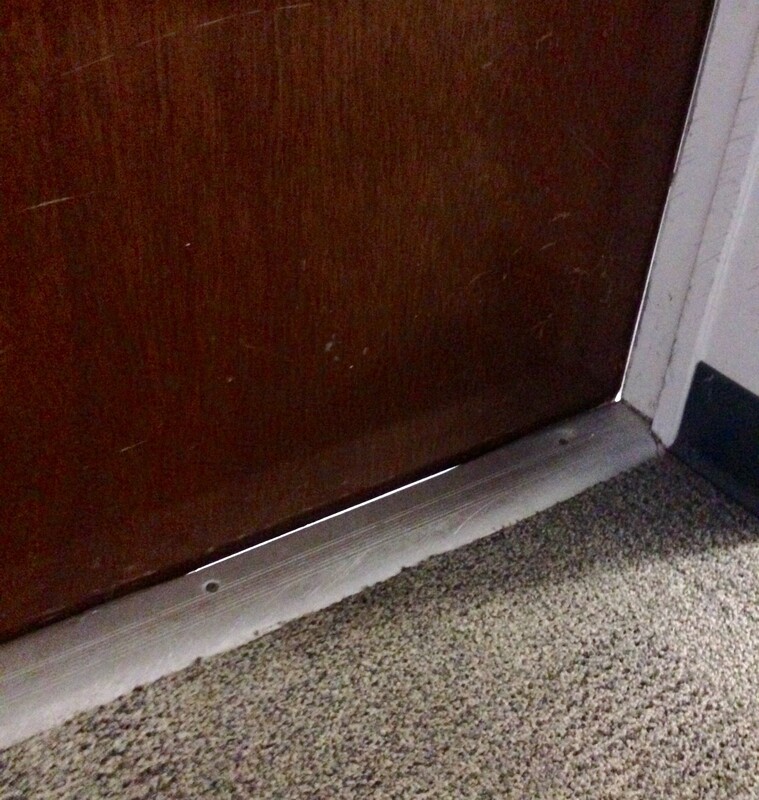 To find air gaps, look carefully for light around the outside edges of doors, door frames and windows. Check that exterior doors have a threshold that fits well to the bottom of the door. If you see gaps, talk to the landlord about the possibility of having them filled before you move in (Figure 1). Does the system seem to have been well maintained? Indoors, the air handler will likely be located in an interior closet, often with the hot water heater. There will be an air filter at the point interior air is drawn into the air handler. Check the filter and the coils behind or above it. Are they clean? Ask if the maintenance staff changes the filter, and if so, how often? If you will be responsible for the filters, keep in mind that once a month replacement is often recommended, particularly if you have pets. Frequent changes of the filter can help avoid mold problems. Also look outdoors at the condensing unit (a large metal box covering a fan). A lot of dirt or overgrown shrubs surrounding the condenser may indicate the overall system has not been well maintained. Ask if there is a programmable thermostat, and if not, can one be installed? Programmable thermostats allow you to adjust the temperature of your apartment to use less energy when you are not at home. It is an inexpensive tool that can make a noticeable difference in your bill if you use it well. Notice how much natural lighting the apartment has and which direction the windows face. Windows that face north and those shaded by trees or other buildings provide daylight without letting in too much heat. Windows receiving direct sunlight will transmit more heat into the apartment, particularly those that face south or west. Ask the landlord if the rental unit you are looking at has low flow fixtures in the kitchen and bathroom. Low flow fixtures include toilets, showerheads, and sink aerators. Those that meet the criteria for WaterSense certification save significant amounts of water—20 to 32% with no changes in service to the home’s occupants. If low flow fixtures are not present, you may want to purchase sink aerators and a low flow showerhead for about $20 and install them yourself. You can remove them to take with you when you move out if you keep the old ones to reinstall. Last, when possible, choose an apartment located near your work, school, shopping, or daycare. You will save time, transportation costs and energy. If you are able to use a bus, a bike or walk to some of these locations, the savings will be greater. Consider whether these are options for apartments you are evaluating. Reducing your transportation costs can offset other expenses or allow greater flexibility in your budget. 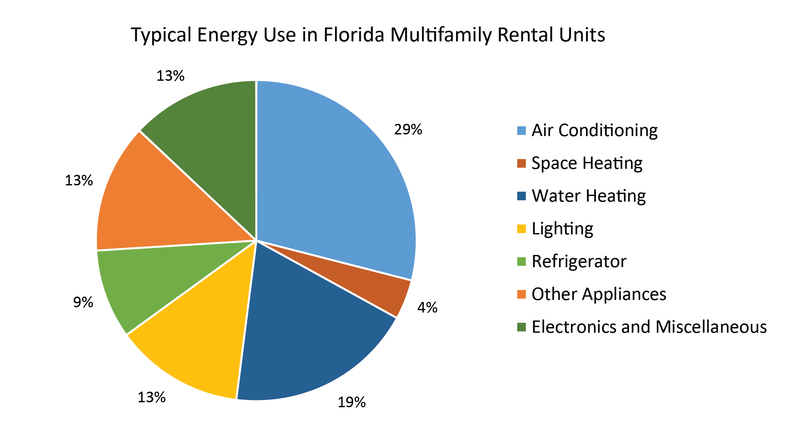 With Florida’s warm climate, air conditioning uses the most electricity in a typical household in multifamily rental housing (about 29%), followed by water heating at 19%. Appliances, electronics and lighting all use about 13% (Figure 2). Over the last few decades appliances and lighting have become more efficient, but power use for electronics has increased. The following sections offer tips on how to reduce your energy use in each of these areas. First improve the air tightness of your apartment. The loss of heated or cooled interior air to the outdoors is a major source of wasted energy. We are usually unaware of this loss because air moves through small cracks around doors and windows, ceilings and floors, plumbing and vent penetrations, and even electrical outlets. 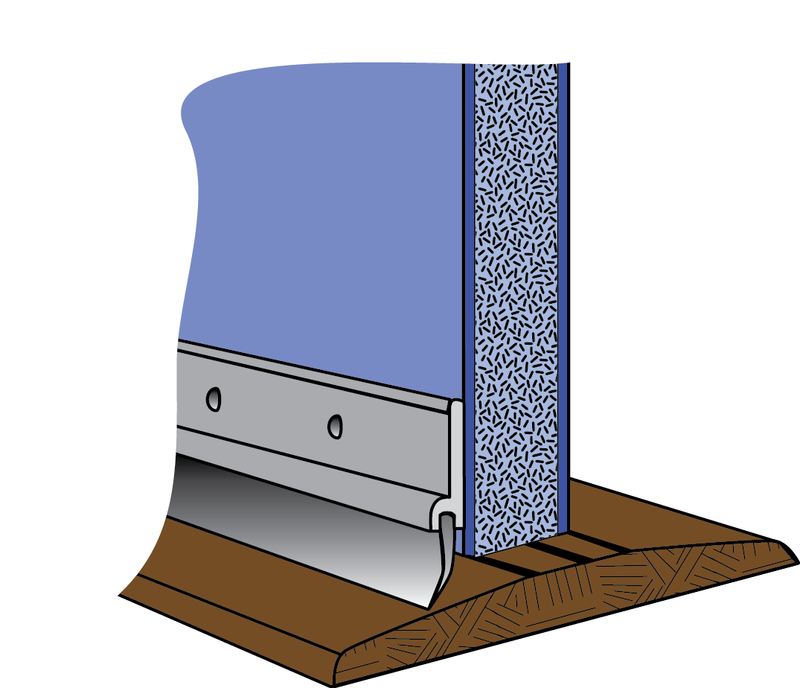 Much of this energy can be saved through sealing these seemingly small gaps, and uncomfortable drafts may be eliminated. Look for air gaps around the outside edges of doors, door frames and windows by looking for light and feeling for air flow. If you find any leaks, have them caulked or filled with a foam sealant or weather stripping. If the bottom of an exterior door does not make contact with a threshold, a door sweep may be added to the base of the door to seal the gap (Figure 3). Foam sealants can also be used to close gaps between walls and baseboards, openings around bathroom piping, vents for exhaust fans or the clothes dryer. Room air conditioners are another common location for air leaks. In many cases maintenance staff will be willing and able to help fix any small problems. If the problems are minor you may be able to fix them yourself with a little caulk or some weather-stripping. More information is available at: caulking and weather-stripping, and detailed instructions on caulking. If your apartment does not have foam gaskets installed behind electrical outlet and light switch face plates on exterior walls, talk to your landlord about having these installed. These can be purchased on-line or in home improvement stores, but are much less expensive (a few pennies each) if bought in bulk. 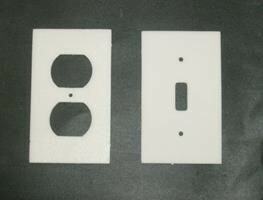 They are pre-cut to standard sizes and fit invisibly behind the face plates. Only a screwdriver and a minute or two each are needed to install these gaskets (Figure 4). In the summer, close blinds or curtains during the day on windows that receive direct sun to reduce solar heat gain and leave them open in the winter. During the spring and fall, Florida has many days where no heating or cooling is required. Think about just turning off your AC/heat system at those times and open a window for ventilation if the outside humidity is not high (not above 70%). Just make sure you close windows and doors before you turn the system on again. Find out where the air filter is located on the air handler. Either change it yourself or have maintenance staff change it monthly. If too much dust or dirt is allowed to build up on the filter, more energy is required to pull air through it to be heated or cooled. Do not completely close vents in an unused room as the added pressure can cause air leaks to develop in the ductwork. Also, make sure that vents are not blocked by furniture or other items. For good air circulation, and even cooling, it is preferable to leave interior doors open a little. Since air conditioning is probably the largest user of electricity in your home, it is worthwhile paying special attention to your thermostat. When you are at home in the summer, set the thermostat’s cooling temperature as high as you comfortably can—78 degrees or higher is a good target. When no one will be at home for a few hours or more, move the setting several degrees warmer. Most AC units will only take a few minutes to lower the temperature on your return home. In the winter the pattern is the same, but reversed in direction. Many people set their day time heating temperature at 68 degrees and lower it about 10 degrees at night or while they are away. However, it is preferable to not change heat pump temperature settings more than 2 degrees at a time. This avoids use of a strip resistance heater, which is built into the heat pump and designed to provide extra heat during very cold weather. Strip resistance heaters are much less efficient and will use more electricity. You can manually change the setting by 2 degrees, then another 2 degrees after the first temperature setting is reached. Some new heat pump thermostats will automatically step the setting up or down in 2 degree increments when you make larger changes in the setting. Find out if yours operates this way to save energy before making large changes to a heat pump thermostat setting. If you are in a hurry to change the temperature in your home, it doesn’t help to set the thermostat higher or lower thinking that the system will work harder in some fashion to reach the desired temperature. Heating and AC systems do not react like a car to an accelerator pedal. For example, if the temperature in your home is 80 degrees and you want to cool it to 78 degrees, just set the thermostat to 78 degrees, rather than some lower temperature. It will take the same length of time to cool the two degrees whether the setting is 78 or anything less than that. A programmable thermostat will remember to change the temperature settings for you, if you program it correctly. If you do not have one in your home, request that your landlord have one installed. They will quickly pay for themselves if used consistently to adjust the setting for 8 hours or more a day, saving in the range of 5% to 15% of your air conditioning/heating costs. More information on programing your thermostat can be found at energy.gov. Make sure that you don’t place any item that emits heat (lamp, TV, computer) close to a thermostat. The extra heat will make it register a warmer temperature. Consider using a fan to extend your comfort range a couple of degrees warmer in the summer. Ceiling fan blades should push air down in the summer and be reversed to push air toward the ceiling in the winter. If your home will be empty for a couple of days, raise your thermostat setting in the summer or lower it in the winter, and reduce your water heater temperature. If you will be away a longer time in the winter the heat should remain above freezing (32 degrees F) to prevent coming home to frozen pipes. During more extended absences, mold can be a problem if the humidity is too high. Heaters and air conditioners do remove moisture from the air, but it is not necessary to run them on a normal schedule. If you have a programmable thermostat, in the summer set it to 72 – 74 degrees F for 2 hours in the cooler early morning hours, say 3 a.m. to 5 a.m., to dry out the air when it is dampest. Hotter, drier air is then not a problem, so you can set the thermostat for 88—90 degrees F the rest of the day. Similarly, in the winter you may need to have your home heated for a couple of hours to remove moisture, then set the thermostat back by 10-15 degrees. Do not turn it off completely if there is a chance of temperatures falling below 32 degrees F to prevent water freezing in your pipes and possibly bursting them. Your thermostat mode should always be set to either “Cool” or “Heat”, not “Auto”; however, set the fan to “Auto” rather than “On” so that it does not run continuously. Ceiling fans can help save energy if you use the breeze they create to cool off and set your thermostat two to four degrees higher. However, fans cool people not rooms. Leaving a fan going when you are not there to feel the breeze does nothing to cool the area; in fact over time the heat from the motor will slightly warm the air. Always turn off fans in unoccupied rooms. In the summer, fans should run counter-clockwise, so that the blades push air down on the room occupants. During the heating season, fans should run in reverse at a slower speed to circulate warm air that rises to the ceiling downward. Most fans have a switch to reverse the direction of rotation. Ask your maintenance staff to check the temperature setting on the water heater and reduce the temperature to 120°F. Water that is hotter than this doesn’t provide any advantage for cleaning or bathing and can pose a scalding risk. Avoid using hot water for laundry; most detergents will clean clothes just as well in warm or cold water. Household hot water does not actually sterilize items; temperatures near boiling would be required for this. Detergents and other cleaning products are all that is necessary for cleanliness. If you have good natural light in your apartment, make use of it and don’t turn on lights unnecessarily. Replace any incandescent light bulbs you have with compact fluorescent (CFL) or light emitting diode (LED) bulbs. For light equivalent to a traditional 60 watt incandescent bulb, you can use a 15 watt CFL or a 12 watt LED. A comparison of the three bulb types is shown below (Table 1). It assumes that a bulb is on for two hours per day for a year, and electricity costs $0.11 per kWh. CFL and LED bulbs will save about 75% to 80% of the energy, with similar cost savings. Also, a CFL should last about 10 times as long as a conventional incandescent, and a LED will last about 25 times as long. Many people are reluctant to throw away incandescent bulbs that are still functional—it seems to make sense to use them until they burn out. However, that logic is not necessarily correct; the sooner you replace frequently used incandescent bulbs with compact fluorescent or LED bulbs, the more money you will save. Even though the purchase prices of CFLs and LEDs are higher, the energy savings over time are likely to exceed the higher initial cost. Because these bulbs last for years and can represent a sizable investment, when moving out you may want to take them with you to any future apartment you rent. If it is too costly to replace all your bulbs at once, start by replacing a few of the ones you use most often. Use task oriented lighting like lamps instead of larger overhead lights when possible. Turn off lights when you leave a room if you will be gone for more than a short while. But be aware that both incandescent and fluorescent bulbs can be affected by too frequent cycling on and off. LED lamps are not. Older refrigerators are less energy efficient, but even if you have an old one, there are a few things you can do to help it to operate as efficiently as possible. Check to make sure that your refrigerator door closes and seals properly. To do this, open the refrigerator door, hold a piece of paper next to the rubberized gasket around the door and then close the door. Then pull the paper out; you should feel some resistance. Repeat this at several locations around the door. If the paper is loose at any point, the gasket may need to be adjusted or replaced. Call your maintenance professional for help. It may mean a few dollars savings on your next bill. 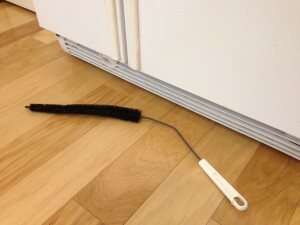 Refrigerator coils are heat exchangers, and they should be kept clean for efficient operation. A layer of dust can build up and prevent them from operating as effectively, as if there was a blanket over the coils. The coils are usually hidden behind a front plate under the refrigerator or may be located at the back. Most people rarely or never look at them, but it is worth your while to purchase a long bristled cleaning tool and put it to good use a couple of times each year (Figure 5). Another way to help your refrigerator and freezer run more efficiently is to keep them full. If either has large empty spaces, put containers of water inside to fill up the space. Once cold, they will help maintain the cold temperature and require less cycling of the motor. Refrigerators and freezers should not be kept in a garage or other uninsulated space. The extreme heat that builds up in garages means their motors may have to run almost constantly to keep food cool during the warmer months, using extra energy. Clothes washers use a relatively modest amount of electricity to agitate and spin your laundry—only about 15–20% of the total energy typically used to wash a load of clothes. The remaining 80–85% of the energy goes to heat water. Washing in cold water is an easy way to save a significant amount of energy. You are not likely to notice any difference in your clothes as most laundry detergents are now formulated to work well in cold water. If your washing machine has more than one spin speed, always use the higher speed. It will remove more water from the clothes, allowing them to dry faster thereby using less energy. Try to wait to wash clothes until you have a full load. If you must wash smaller loads, adjust the water level as appropriate. This saves both energy and water. To avoid problems with moldy smells in your washing machine, only use a small amount of detergent. Too much can leave behind a film on the inside of the machine, providing a moist breeding ground for bacteria and mold. Then leave the door or lid open to allow the interior to air dry. (Ensure that young children or pets do not climb inside while it is drying.) Pay special attention to keeping the rubber gasket dry on front loading machines. Dry light weight clothes separately from heavier items such as towels. Don’t over-dry. Use a moisture sensor to turn the dryer off if it has one. Clean out the lint trap after each use. If too much lint builds up, it reduces efficiency by blocking air flow and can be a fire risk. Air dry your clothes. If you want, you can put the laundry in a dryer for a couple of minutes to remove wrinkles and soften towels. Then remove the items and hang them on clothes hangers, folding racks or a shower rod. Indoor air in the winter will benefit from the extra moisture, making it less drying for skin, eyes and sinuses. If you do not have air conditioning, you need to provide ventilation or skip air drying laundry indoors during the summer when humidity levels are high. Consider asking maintenance if you can install a clothesline outside if you have a porch or greenspace next to your unit that could accommodate one. If you use an automatic dishwasher, try to wait until it is full before you run it. Many newer dishwashers recommend that you only scrape food off of dishes before loading them, so careful rinsing of the dishes is not needed. Finally, if you have the option, turn off a heated drying cycle at the end, and let the dishes air dry instead, unless you have humidity problems. You can leave the door closed until dishes are partially cooled to avoid letting hot steam out into your kitchen. Turn off electronics such as TVs, computers, and stereos when you are not using them. However, after they have been turned off, most of these devices go into “standby mode” and still draw power. TVs, gaming systems and cable boxes are usually the worst offenders, but anything with a remote control has a standby mode and is using some power even when you have turned it off. This type of power consumption is called a phantom load. Be conscious of water use and look for ways you can avoid wasting water in your home. Perhaps you can collect the water that otherwise goes down the drain while you are waiting for hot water to arrive at the sink or shower. It can be used to water plants or fill a pet’s water bowl. When you are running water for a short time, use cold water rather than hot. It is easy to not pay attention to the position of a faucet control and turn on hot water. Even if it doesn’t run long enough to become hot at the faucet, energy will be lost from hot water being drawn into the pipes. Florida’s plumbing code places limits on the amount of water that household fixtures use. EPA WaterSense fixtures use even less water. Over several decades, design changes to toilets, sinks, and showerheads have greatly reduced the amount of water we use in our homes. Clothes washers have also become more efficient. Find how much water your family could save with EPA’s on-line Water Saving Calculator and whether your utility offers rebates on WaterSense certified replacements at WaterSense Rebate Finder. Toilets are typically the largest water consumer in a household. If the toilet uses more than 1.6 gallons per flush ask the landlord to replace it with a more efficient toilet, possibly a high efficiency toilet, using no more than 1.28 gallons per flush. There is no difference in the look or function of these toilets—they just use less water each time they are flushed. The sound of water running for a few seconds in a toilet that has not just been flushed indicates water is leaking from the toilet tank back into the bowl. The toilet’s flushing mechanism will automatically add more water trying to keep the tank full. This won’t damage anything, but the constant loss of even a small amount of water can add up to a large volume over time. A simple way to test for this type of leak is to pour some colored liquid such as tea or coffee in the back or tank of the toilet and let it sit for about 15 minutes. If the water in the bowl begins to color, there is a leak. Maintenance staff should be contacted to replace the flapper in the tank of the toilet when this occurs. If your shower head is not a low flow model replace it with one that is. These allow less water through the showerhead but maintain a fast, forceful flow. The flow rate in many WasterSense labeled showerheads is 1.5–2.0 gallons per minute (gpm), while new standard showerheads use 2.5 gpm or less, and some older models can use over 4 gpm. If you purchase a low-flow showerhead, you can take it with you when you move or leave it for the next tenant. To measure the flow from your showerhead, catch the water in a bucket with a known volume (from the showerhead flowing on full for 1 minute) or measure it by emptying it into an empty gallon milk jug or other container of known volume. Another sure way to save water is simply to take shorter showers. 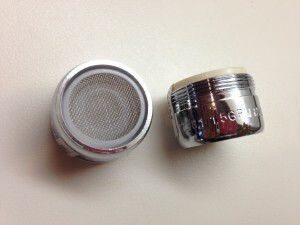 Faucet aerators control the rate of water that can flow from a faucet when it is fully on. All sink faucets come with removable aerators and it is a relatively easy task to exchange them. They can be purchased at hardware stores very inexpensively (Figure 8). If you look closely at the aerator it will be marked with its design flow rate, perhaps 2.2 gpm. This means the faucet running full will allow 2.2 gallons of water to flow out in each minute. Just replacing a 2.2 gpm aerator with a 1 gpm aerator will save more than half the water typically used for washing hands, brushing teeth, etc., without a noticeable change. Get dripping faucets repaired quickly. It is surprising how much water can be lost from a dripping sink over weeks and months. It is also a good idea to periodically check for leaks around plumbing connections under sinks and around showerheads. Look for wet areas, discoloration or mold. If you are not sure whether a leak is active you can feel whether the piping, wall or cabinet is wet. Contact maintenance staff as soon as possible to repair any leaks before there is significant water damage. Florida Solar Energy Center, Effectiveness of Florida’s Residential Energy Code: 1979:2009, June 2009. Environmental Protection Agency, WaterSense, accessed May 8, 2015. U.S. Energy Information Administration, Household Energy Use in Florida, from the 2009 Residential Energy Consumption Survey. 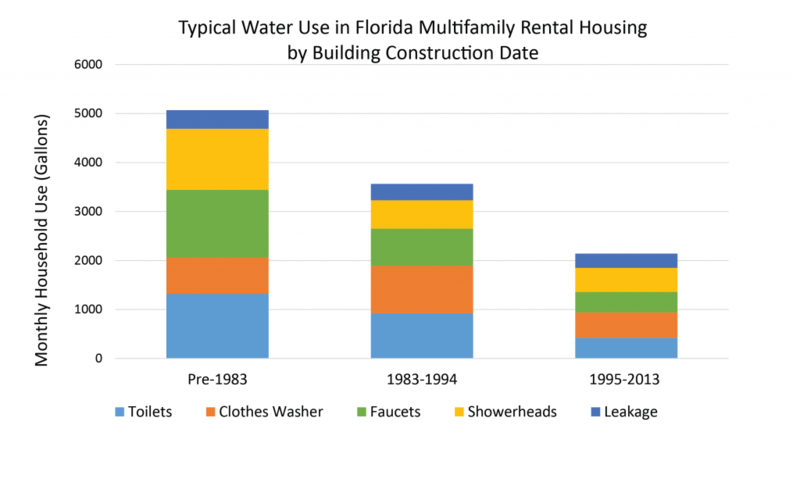 Florida Multifamily Efficiency Opportunities Study, Prepared for Florida Department of Agriculture and Consumer Services—Office of Energy, (Energy End Use – Figure 2-5, assumptions for energy modeling Table 2-5, Typical Water Use – Figure 2-7, and assumptions for water use Table 2-8), January 9, 2015. Hyun-Jeong Lee, Kathleen C. Ruppert, and Wendell A. Porter, University of Florida IFAS Extension, Energy Efficient Homes: Indoor Air Quality and Energy, accessed May 22, 2015. Energy.gov, Thermostats, accessed May 8, 2015. Energy.gov, How Energy-Efficient Light Bulbs Compare with Traditional Incandescents, accessed May 11, 2015. Community Weatherization Collation, Energy Auditor Training Manual, Gainesville, Florida, 2015. Florida Multifamily Efficiency Opportunities Study, Prepared for Florida Department of Agriculture and Consumer Services – Office of Energy, (Energy End Use – Figure 2-5, assumptions for energy modeling Table 2-5, Typical Water Use – Figure 2-7, and assumptions for water use Table 2-8), January 9, 2015.